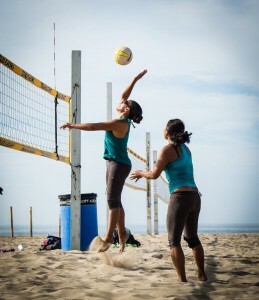 Outside hitters in volleyball are known as being the go-to offensive players in times of trouble. Every once in a while they get a planned offensive set from the setter, but there are many times when the setter ends up scrambling to compensate for less than perfect passes. Outside hitters often step-up in clutch situations like this and assist setters with keeping the offensive play alive. The pressure can be challenging. However, the following tips can help outside hitters be the hero their team needs during crunch time. Hitters and defenders underestimate the power of an off speed shot, a.k.a. the roll shot. The off speed shot is as powerful as a swing when it is done right. This simple hit literally rolls off the bottom of your palm just over the block where no one is. Although it sounds like it won’t accomplish much for you, but it will. Go up strong like you’re going to hit hard, and at the last second just gently roll it. You will see how much this will throw off the defense. Now obviously, don’t play it safe and do this often, because the defense will pick up on roll shots eventually. Pull this trick out when you are in a tight situation and be strategic about it. Especially when you are swinging hard, but nothing seems to be working. Remember, a kill is a kill as long as the ball touches the ground. Don’t get carried away and think you have to be a power hitter at all times. This is the typical outside hitter mentality, but isn’t necessarily true. Yes outsides do need to be powerful, but they also need to be smart. Outside hitters that progress and start playing more competitively, will find that just power swinging isn’t going to get them very far. Many times the softest kills are the smartest kills. This means, don’t just be a line hitter or a cross hitter. Yes, you might get kills in one shot more than others. It’s great to have a swing that you’re confident in for one particular shot. However, teams will watch film on you and adjust their defense accordingly the more you play this game. You will get shut down immediately. It’s important to be a versatile hitter that can hit many different shots. Cross and line are just two of many shots you can hit. Try swinging hard angle right at the side line. Or switch it up and make the front row dig by swinging sharp cross. If you’re going to swing line, swing to the corners. Don’t be afraid to switch things up. If you are significantly better at one specific shot, it’s okay! Everyone has their strong points. If you are weaker at swinging line, make that your priority to work on. Spend some extra time on the swing you are most weak in. It will pay off to have more options as a go-to hitter. Another thing one-dimensional hitters tend to do is only hit to zone 6 or middle back. You’ve seen it before, and possibly done it; an amazing swing, but directly to the middle back defensive specialist or libero’s arms. This happens because naturally, it’s the easiest swing for our bodies. But essentially, it’s ineffective, most of the time. Unless you notice that there is a huge hole in the middle back area, it’s important to focus on the least defended areas of the court. Coaches usually put their better, if not their best, defensive athletes back there. So hitting there won’t always get you the immediate kills that you are aiming for. This is also known as tooling the block or hitting the ball into the opponent’s hands so that it goes out of bounds. Extremely difficult to grasp, however, a great habit to build on. This is an extremely big advantage for shorter outside hitters, because it allows them the chance to make a kill without having to be a complete power hitter. If you find yourself attempting this skill but getting stuff blocked, chances are you are swinging straight on. A simple turn of your wrist will make all of the difference. If you are right handed and hitting from the outside, make sure your thumb is turned upwards. If you are left handed your thumb should end up down. The ball is more likely to bounce out if you follow these steps. A great way to practice this skill is to have a teammate or coach hold up a big exercise ball and stand on a chair or box on the other side of the net. Practice the thumb up or down motion. This will help instill muscle memory for this swing. You will get the basics of this swing down quickly practicing this way. It will introduce you to what it will be like to do it against real blockers. After you’ve taken some decent swings and feel like you’ve mastered it, take it to practice with real blockers. There is often lots of pressure placed on outside hitters. Mental focus and strategy in this position is just as important as athletic ability in helping outside hitters play well under pressure. 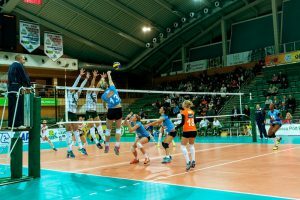 With consistent practice, these tips for outside hitters can help build confidence, improve skills and ultimately contribute to any teams overall success on the court. I am a former collegiate volleyball player and I absolutely adore this game. 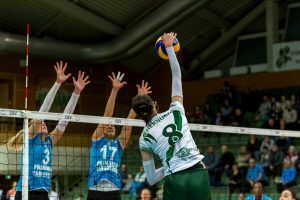 I am pursuing ways to stay connected to volleyball, and writing about it is one of them! Coaching is another way I intend to stay connected to volleyball. When I am not playing or coaching volleyball, or working for my fantastic clients, you can find me curled up with a great book or watching my favorite TV show, Survivor!